Fall has set in here in Oly, and we've been holing up in the studio, working hard on our next studio album, targeted for release in spring 2014. 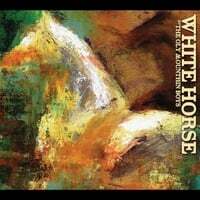 With "White Horse" we've set out to do something unprecedented: a concept album that tells a life story from beginning to end through original bluegrass. The album's songs center around Charlie McCarver, drawing on local history by setting the story in early 20th century Washington State. It begins with his happiness in youth with wife Lisa-Ann and their children. When his marriage unravels and his family leaves him, the songs chronicle Charlie's psychological crack, descent into violence, and life on the run. The album closes with songs that explore Charlie's memories, regrets, and confrontation with aging and death. An important part of this album's concept is to enrich the music's vision of the characters by seeking out fiction writers and visual artists to create short prose pieces, drawings, and photos that will be packaged with the music. If this sounds intriguing to you, we want to hear from you! Stay tuned for pre-order information - or if you can't wait, come check these songs out live! August was a whirlwind! We rubbed elbows with a famous fugitive at the D.B. Cooper Music Festival (see photographic evidence.) We trekked from Edmonds to Toledo in one day for our debut at the Mount Saint Helens Bluegrass Festival. We made a couple pilgrimages to one of our favorite places, Tacoma (check out some great video from the Proctor Arts Fest). And this past weekend in Long Beach, Washington, we learned that we can play about 11 hours of bluegrass without repeating a single song - too bad we only had 10 hours worth of gigs there! And even more exciting - all this fall we'll be performing songs that we're about to begin recording for our next album. We think it'll be a revolution in bluegrass - a concept album, telling a single story across more than a dozen songs, entitled "White Horse." Stay tuned for more news! We're road trippin in Western Washington this August. We closed out July with a bang with a set at the very first Steamboat Bluegrass Festival, an event we hope comes back around every year for years to come. Thanks to all those who came out and to all those who worked hard to make it happen. And thanks to Windy Hill for making the trip from California to be there - they'll be in the Northwest all month, so check their tour schedule and go see them! DO NOT MISS the Steamboat Bluegrass Festival! Friday, July 26th, 5pm, at the Prosperity Grange, Steamboat Island WA. What do you do when you have a critical mass of bluegrass bands in the same place at the same time? Found a bluegrass festival! We're excited to get in on the ground floor of the first annual Steamboat Bluegrass Festival, and to reunite with our pals Windy Hill from San Francisco, who played our CD release show for Through the Sky! Olympia's Pine Hearts, Rooster Crow, Black Hills, and Dan Spencer round out the bill, and it's all a benefit for the South Sound Estuary Association. Kicking off the summer festival season! Summer's here, and that means bluegrass festivals. Bluegrass from the Forest Festival in May was a great time this year! We were thrilled to be a part of it - check out some great videos from our sets on Friday night and Sunday afternoon! Lots of summer bluegrass lies ahead! We had some great shows to start the new year, including some for great causes. Check out some great photos on Facebook from Joel Kluger and Eric Frommer taken at the Olympia Community Bluegrass Music Show! We also had the distinct pleasure of appearing on a new Youtube broadcast called Olympic Peninsula Spotlight. It's produced by Circle of Sound Studios, where we recorded Through the Sky. We hope you'll give this a listen (lots of great bluegrass info in there, folks) and follow the broadcast as they highlight local music! Matthew Warnick and Rick Nichols of Circle of Sound studios (where we recorded our most recent album, Through the Sky) have created a broadcast to place a "spotlight" on independent artists of the Pacific Northwest. They were kind enough to feature us on a recent episode - check it out! Pickin in the new year! We were really thrilled to close down 2012 with an awesome party at the Olympia Ballroom with Hillstomp, and a rousing sold-out show at the Nectar Lounge in Seattle with Pickled Okra, Jack Dwyer, and Brandi Carlile! Now it's time to ring in your new year with a little bluegrass... check us out this month! If you attend one Oly Mountain Boys show this year... make it this one because the year's almost over! Seriously though, punk blues duo Hillstomp has a history of rocking Oly establishments. It's been a long time since they've played Olympia, and we're expecting the pent-up demand for their raw and electric brand of bucket-and-slide rock to be HUGE. The Oly Mountain Boys are pleased indeed to "grass up" this occasion, and we can't wait!! See you there! Our fall schedule is starting to take shape... come out and see us!